MIXED CHICKS paddle brush with hardened plastic and a thick WOOD HANDLE is very popular for people with wavy hair, curly hair, and tangled hair. Réalisée en matière plastique robuste avec un manche en bois, cette brosse est parfaite pour les personnes aux cheveux ondulés, bouclés et emmêlés. Voorzien van geharde kunststof en een dik HOUTEN HANDVAT is dit een zeer gewild item bij mensen met golvend haar of krullen en bij haar met knopen. Con plástico endurecido y un MANGO DE MADERA grueso, es muy popular entre las personas con cabello ondulado, rizado y enredado. How I wish my Mom used this to brush my hair as a child! As a mixed girl with 3b/3c hair (Google if you don’t know what that looks like), brushing my thick curls was always a dreaded, painful, and time consuming experience. I bought this brush 2 years ago and it’s made me LOVE brushing my hair ever since! Whenever I’m in the shower and I need to de-tangle, I just break out this brush and gently brush through my locks.In about 5-7 minutes I have nice, defined curls. Use some conditioner to make the job even easier. My de-tangling routine used to take me 20 minutes, now it takes 5! What’s great about this brush is that it saturates my hair quickly, and easily disperses products like conditioners, oils, and creams all throughout my hair. Just do this sparingly if you have product that you want to leave in, as the comb will pick up the product as you brush it through. This brush is also great for styling. This paddle brush gives me big, fat curls and ringlets, rather than the small individual ones I would normally get with a wide toothed comb. The brush is durable,the little teeth stay in for a long time, and the handle stays in good condition even after being used in the shower every brush time! So no worries about significant water damage. Whats also great is that this brush just seems to slide right through my hair like butter, making brushing a nice, relaxing experience. Even on my worst tangle days, I never have any pain or ripped out hair! No painful tugging on snarls and tangles! So whether it’s for your hair or for your child’s, this brush is a MUST. I am Caucasian with straight hair, but my daughter is half African with gorgeous ringlets. The ends of her hair were always somewhat tangled until I started using this brush. 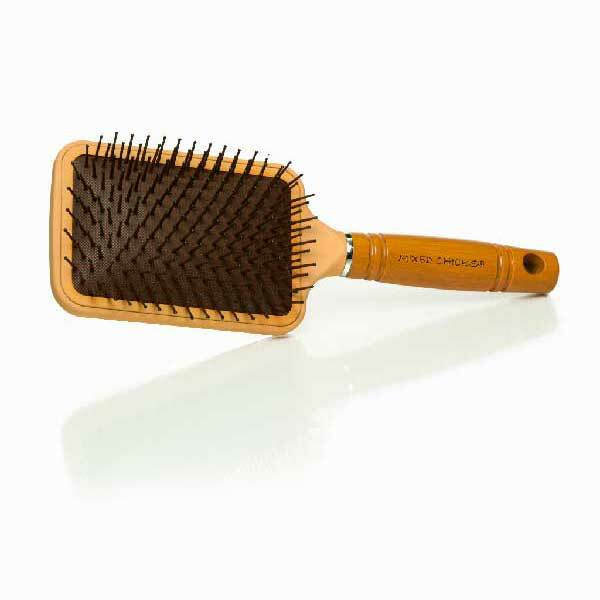 Using this brush (soaking wet loaded with conditioner of course) produces the most amazing results from scalp to tip. This is a must have for curly hair! I truly love it! It works amazing when it comes to detangling my hair. I can use it on both wet and dry hair with no problems. It really is one of the best brushes that I own. I definitely recommend getting one of your own! OMG!! I don’t think I have ever enjoyed brushing my hair as much as I have with this paddle brush. I think the Mixed chicks products I’ve been using for the past two months may also have helped, however this brush, brushes my hair without a single trouble. I use it right after I put a little bit of the leave in condtioner, and it goes striaght through my hair without any trouble. It has actually made me ( a very curly haired girl) enjoy brushing my hair!! This is the best brush ever! I have struggled trying to comb by hair in the shower, but after using this brush I don’t struggle any more! This is the first time that I write a review but I had to share my love for this brush!!! I was a little hesitant to buy this brush at first even with such positive reviews. This product met and surpass all of my expectations. I use the brush to detangle my daughter’s extremely curly hair. I went from 20 minutes of screams and cries to 5 minutes or less of silence!!! I definitely recommend this brush to anyone regardless of hair type. I bought this paddle brush 3 weeks ago & I wish I would have bought it when my daughter was younger! She is six & has very curly, very thick hair & like others on the site I was using a large comb on her hair. Bathtime was never a fun time when it was time to comb her hair but now no complaints & she says it doesn’t even hurt anymore. I would recommend this as a must for anyone whose child has thick, curly hair. I just received this brush today and used it on my daughter who has very curly hair. I must admit that this has been the easiest time I have ever had brushing her hair without any effort and without her hurting. I also used the sample shampoo, deep-conditioner, and leave-in conditioner, as well as the gloss treatment! I love this product and so does my daughter! I test anything I will use or rec. to/on clients on my own head first. This brush has a nice pad and the bristles aren’t too stiff, so it feels good. I also like simple but classy looking accessories in the shop. This brush looks as good as it feels. I have no problem telling my clients about this. ONCE I GET DONE WASHING AND CONDITIONING MY CURLY HAIR I THEN TAKE THE MIXED CHICK LEAVE IN CONDITIONER AND APPLY IT TO ALL THE SECTIONS OF MY HAIR, ITHEN USE THE PADDLE BRUSH AND IT HELPS GET RID OF THE KNOTS AND TANGLES I HAVE IN MY HAIR LEAVING IT EASILY MANAGED.